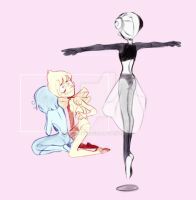 itd interesting how the pearls outfits are designed - Blue and Yellow’s outfits are very similar, leotards with one having fabric at the top and the other at the bottom. Pink and White’s are also similar, with Pinks just being more,,,poofy? and with all the theorizing about White Pearl originally belonging to Pink, it would make sense why her outfit looks similar to Pink Diamonds, but it’s just...interesting. pink pearl in general is really weird to me because the rest of the pearls pretty much only have the colors of their diamonds in their design and shes kinda all over the place if you nah mean?? ?